Think "Driving over Lemons" but instead of the Alpujarras, relocate to the Sierra Sur , asmall corner of Seville. province , nestled between Cadiz and Malaga provinces. Underneath the highest peak in the area is our farm. The perfect place to relax and unwind , a pretty stone and plaster farm cottage, a farm track that no one likes much and a warm welcome. T raditional but not typical the cottage is cosy and comfortable with large bathroom, kitchen/sitting room, log burner, and 2 bedrooms, one of which is a double. Outside the large rough stoned patio looks out over old olive trees, seville orange trees and woods. The night sky is very often splendid, causing many a neck ache and exclamations of wonder. Around us there are both walks and ambles, our two neighbouring villages are 3 kms away and welcome vistors as this is not a tourist area. There are bars and shops in both and prices are extremely reasonable. As we are quite centrally placed day visits are in abundance, beautiful lakes, big cities such as Seville and Granada, smaller towns such as Osuna and Ronda plus the famous white villages are all at hand.Children and pets are welcome and kids will find plenty to do from playing with the animals to roaming the woods near the farm. A stay on this farm is a true country experience and one which will leave you feeling refreshed and relaxed. I have lived in Spain for over 25 years, teaching English, farming and bringing up my 4 wonderful children. I give English classes to young people from the nearby villages and have set up a lovely classroom on the farm where I can also give basic Spanish classes to those who are interested. I have had many lovely and interesting guests to stay over the past few years and have often enjoyed spending an evening with them, either at home or in the village. I am always ready to help or give advice whenever needed. It is a very special place and we still love it, 27 years later. This is not a place for high heels or luxury seekers but it is quiet and relaxing as well as being full of character with a great "ambiente" Standing at 600 metres we are surrounded by trees but with open views across the countryside as well. In the Summer golden orieles nest here and the liquid sound of the bee-eaters can be heard most Summer nights. We are excellently placed for visits to Seville, Granada, Malaga and Cordoba, and Ronda is less than an hour away. We are also near the stunning lakes of El Chorro near Antequera and even nearer to the Peñon of Algamitas where there are some bolted climbs. I myself can offer basic Spanish classes. Dividing your time between the casita patio and visits to the nearby sites and cities provides a perfect holiday. Large bathroom with shower/bath, toilet and sink. Outside: The farm comprises 8 hectares and the house is situated a little off centre of the land. The patio for the cottage comprises a raised platform surrounded by gardens, overlooking old olive trees. Patio with barbecue, table and chairs. Cleaning / Towels / Linen / Maid service: Towels, sheets and blankets included. Sheets and towels changed weekly. Clean, quiet and relaxing place to unwind. Great massage from Liz. Comfortable bed. Friendly welcoming hosts, dogs and a happy goat! - love to return! My husband and I have a double celebration at this time in February where we celebrate both our wedding anniversary and his birthday. We'd been to Malaga the previous two years and stayed in resorts but we wanted to do a something little different, a little special. There was nothing more special than staying at this gorgeous farm owned and looked after by Liz and Dani. In our rental car it took about 2 hours to get there from Malaga Airport and to go to Seville, Granada and Ronda took between 1 and 2 hours. If it's remote you're after, this is it. The cottage is just absolutely gorgeous. It's attached but set behind their farmhouse, with a lot of land if you want to go exploring, which we did on one of our down days at the weekend. There's plenty of room for the two of us, using the second bedroom to keep our suitcase in. The kitchen diner is where we spent most of our time when we were home and my husband became a dab hand at keeping the wood burner going. In February it does get a bit nippy but the burner does give off a lot of heat. With the heater in the main bedroom and extra blankets you're more than equipped to stay warm at this time of year. Although it's not really a working farm there's a menagerie of animals, including dogs, cats, horses and a kid (baby goat). The land surrounding the farm and the cottage was just beautiful. We spent time outside when we could and with just the usual sounds of nature the surroundings could put you in a meditative state, that's how calming it was. Liz and Dani were wonderful hosts, very welcoming. They were very approachable if we needed information on the area and we sat and chatted with them and felt very much at ease. Conversely they could also be discreet and leave us alone. As I said, the perfect hosts. For your staples the nearest village was a couple of kilometres away, for your main shopping needs you could go into Osuna, a town itself steeped in history and culture. We absolutely loved this the cottage, the best holiday we've had in a long while. Thank you to Liz and Dani for your welcome and allowing us to stay. We had a wonderful time and we've taken home beautiful memories. We'd have no hesitation staying here again. Wow Regina, what a great writer you are!!! Thankyou so much for your lovely review, you must have done this before, i really couldnt have put it more succinctly myself!! I hope people read it because it is a perfect explanation. We enjoyed having you both too, I would have loved to have talked to you both more actually because you had such a different view of life outside the farm, I loved Grants description of the new Range rrrrrover with the massaging seats!!! 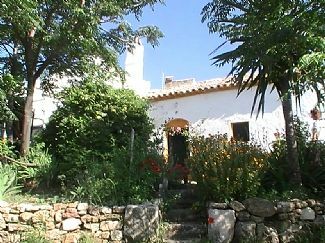 Older Andalusian farm house; functional for longer visit; outdoors charming; a rural retreat! Liz and Danny were wonderful hosts. Outgoing, personal, and discrete. Liz knows Spain very well and her day trip excursion suggestions were informed and well pointed. Liz and Danny introduced us to rural Spanish living: tranquility, simply but very charming. Surrounded by olive groves we had the opportunity to have a true experience and we learned a lot about Spanish culture, customs, and lifestyles. It was a positive experience that opened our hearts and compassion straying way off the tourist path. We were at the farm - "finca" over 2 weeks. We thank our hosts for the experience. We were completely delighted with our guests from Alaska, they were open to every new experience both on the farm and in the local village where they made good friends with the local barman, Salvador. They were extremely easy guests and it was fascinating to hear opinions and stories from their very different home in Alaska. Ted even removed the alternator from our ancient tractor(we will let him know when it is up and running once more). As for Brigitta, her experiences in South America as a girl were amazing. It was a delight to have them to stay. thankyou for your kind words. it was a joy to meet such a fun and lovely family. We look forward to meeting again in the future. Truly a unique experience for those looking for something different. If you've read 'Driving Over Lemons' this is a great description. Liz and Danny were charming hosts and helpful in all ways. We even got massages from Liz 😀򐀡 The bed was comfortable, the kitchen adequate, and the best part of staying at 'Olla de la Margarita' was sitting outside in the evening with a glass of wine and listening to the birdsong, with not another farm or human in sight!!! A great respite from the busy, touristy areas. If you are looking for 4 star luxury this is not the place for you. It was the experience that we rated 4 star. We will definitely return to 'Olla de la Margarita' on our next trip to Spain. Bird watchers will be able to see golden orieles, bee eaters and hear nightingales. Walkers will be able to enjoy the many tracks that criss cross the olive groves.There is a large "classroom" available for activities such as yoga or even group meetings when not in use as a classroom. It is equipped with a whiteboard and a computer. The owner Liz is a qualified teacher who can give basic Spanish lessons or English classes to any level.. Horse riding can be arranged in Olvera, where there is also a "Via Verde", or old railway line where people can walk, cycle or horse ride. There is also an observation point for the vulture sanctuary at Zaframagón on the same track. We are very near the "Camping" of Algámitas where there is a good restaurant and various activities such as horse riding and archery, and, for the more adventurous, there are bolted climbs on several of the rock faces of the Peñon de Algamitas while El Chorro is a 40 min drive away.. Nearest beach Torremolinos, 1 and a half hours drive. Nearest lakes Los Embalses del Chorro, 45 minutes drive. Nearest public swimming pool Villanueva de san juan, 10 minutes drive. Distance to Malaga airport 1 and a half hours. Distance to sevilla airport 1 and a half hours. Distance to Jerez airport 1 and three quarter hours. Granada 1 hour 40 mins. Sevilla and Malaga both 1 hr 35 mins. Villanueva de San juan 10 mins. Booking Notes: Changeover day is not specified but departure time will normally be 12.00 midday.Please leave the Casita tidy and empty the bins.